Welcome to my Red Couch where you will want to enter my $75 CSN online stores giftcard giveway. Click HERE to enter. Do you like Velveeta? I am not exactly a cheese snob or connosisseur ---though I did grow up in Wisconsin.... I don't think I remember ever buying or using Velveeta cheese in my married life. But the other day I found a recipe I had printed out from Yvonne's, Stone Gable, blog. The soup was an adaptation of a Paula Deen recipe. Yvonne called it "Paula Deen meet Stone Gable!" Even though I am not used to cooking with Velveeta, I thought, if it is good enough for Paul Deen and Yvonne, it's good enough for me! 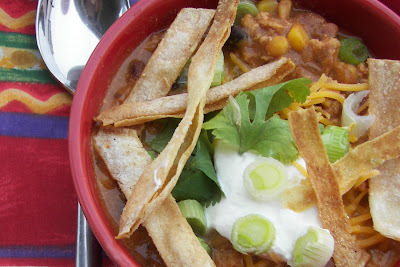 They were right -- it was the best taco soup I have ever eaten. It makes a HUGE batch, so make sure you use a large crockpot, if you go that route. I have some leftover soup tucked away in the freezer for a night when I am too busy to cook; leftovers are like money in the bank! This is a very hearty soup great for a cold winter evening. 2 pounds ground beef -- I used ground chicken. Tortilla Strips -- See below. Heat oven to 350 degrees. Cut tortillas in strips. Place on baking sheet. Sprinkle with oil and salt and bake for about 10 minutes. You may want to flip them about half-way through baking. Brown the ground beef or chicken and onions in a large skillet; drain the excess fat, then transfer the browned beef and onions to a large slow cooker or a stockpot. Add the beans, corn, tomatoes, salsa, beef stock, taco seasoning, velveta cheese and ranch dressing mix, and cook in a slow cooker on low for 6 to 8 hours or simmer over low heat for about 1 hour in a pot on the stove (if cooking soup on stove omit cheese and add at the end of cooking time- stir in until it melts) . To serve, top with sour cream, cilantro, cheese, green onions and crispy tortilla strips. This looks and sounds really good. I will add it to the list for our short menu next week. All the kids love anything "taco style." Looks SO YUMMY... and I'm a BIG FAN of leftovers for the freezer and lazy quick meals... Thank you Joni! I am SOOO not a fan of Velveeta... however there are a few recipes where it really does the trick and blends in so nicely you don't know that you've got it in there..lol..
That sounds fantastic. Soup is my favorite meal any time!! Do you mind if I feature you and your recipe on my blog? If Joni, Yvonne and Paul Deen recomment it, is sounds fantastic to me. I agree, I don't use it much but there are some recipes that just need it. Sounds like it would make this so creamy. We should make it for up at the cabin. I just read Donna's chocolate breakfast post and I had to go have some chocolate. I will email the chocolate bread recipe to her. That sounds and looks delicious...see it on the menu in the next week or so! Thanks for posting it, Joni. This sounds good, I will give it a try. Thanks for sharing. Argh! I thought I had another Taco soup recipe! I have tried Yvonne's and it is awesome! I believe that I have some stashed in my freezer too. That is if the guys didn't take it to deer camp! Now I want taco soup! That looks delicious to me, and I think the husband would like it as long as he didn't see me making it with Velveeta cheese. Ignorance is bliss, after all. That looks like it has everything hubby loves except for me. In my recipe file for sure. Visiting from Jenny's, and S is for Soup sounds scrumptious. Thanks for the receipe. You can bet I will be back often for your receipes! Souper Slow Cooker Recipe! Velveeta? Not in a million years. It's not snobbery, it's a health-conscious choice. The recipe sounds delicious otherwise. I'd have to add some more hot to it though. This will be a great soup to put in the freezer for nights I don't want to cook or quick Saturday lunches. 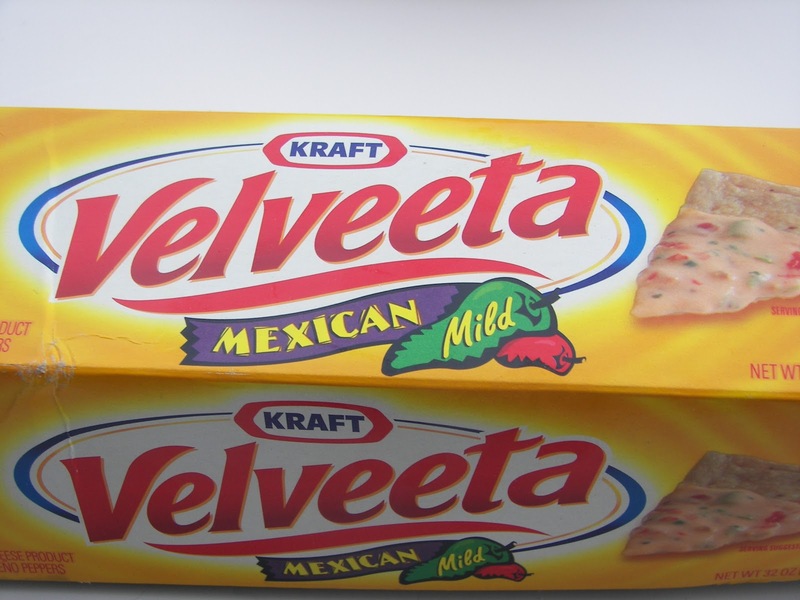 I am well aquainted with Velveeta, she visits my house often! I bet the Velveeta makes the soup super rich. I've never come across anything that sounds quite like this. I'll bet it would be popular at my house. Oh! I have a friend who makes this soup! It is really delicious! Thanks for the recipe. I can't wait to try it. Wow, this recipe sounds great, Joni, and I have a big crock pot too (Hooray for leftovers)! I'm sure the Velveeta melts down smooth and creamy:) YUM! hmmm, in a household of two i think this would last me almost forever in the freezer, and it sounds yummy! This, by the way, looks amazing. I will definitely give it a try! Joni, That sounds really good! Velveeta is good for grilled cheese sandwiches, too. Hope all is well with you! YUM! That is my type of soup! Sound delicious! Wow, this taco cheese soup looks hearty and satisfying! Thanks for sharing. I bet it tastes winderful too! That looks fantastic! My kind of soup with all the cheesy goodness. I hit the save button as soon as you said the best soup ever! I sat here and laughed about the Velveeta comment. My recipe in my sidebar for my most requested appetizer uses Velveeta. I actually always find myself apologizing when I give people the recipe...but, it tastes good. 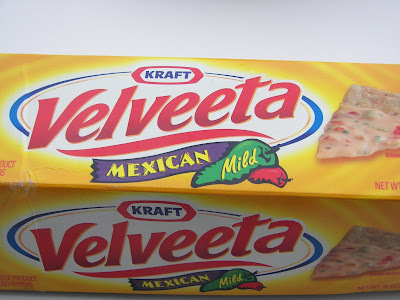 I also use Velveeta on occasion melted with salsa or chili as a dip for taco chips. That's it...I like "real cheese"! Sometimes we have to adjust our thinking and just enjoy. Wow, this looks delicious! And it would definitely feed a crowd! Looks scrumptious.. will have to try this one.. I love slow cooker recipes! 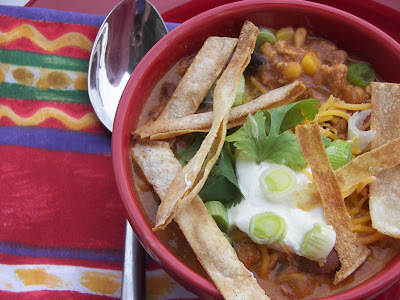 We made taco soup about a month ago, and used Campbell's cheddar cheese soup but it wasn't very cheesy. I'm definitely going to try Velveeta next time and see if that makes a difference. Thanks so much for sharing! Wow that looks delicious, and I consider myself to be a taco soup connoisseur! ... Ok maybe not, but that looks better then my recipe, so I will have to try it! What a great tasty sounding recipe..can't wait to try it..I am a new follower..greetings! What a delicious sounding recipe. I'm not a fan of velveeta either but if it's good enough for you I'm sure it would be fantastic! Thanks for a superb stop this week on our little journey through Alphabe-Thursday's letter "S". Thank you so much for this wonderful recipe. I did it stove top and it was awesome! Even my picky 22 yr old loved it! I am going to post it on my blog with a link to your blog. Thanks again for sharing. Your whole blog makes me hungry. So nice. This recipe was written for me! YUM.